Soothing calendula and nourishing baobab come together in this gentle Juicy Chemistry Organic Baobab & Calendula Baby Massage Oil to keep your baby?s skin deeply hydrated. Jojoba, sweet almond and vitamin E heal and soften the skin. Antimicrobial camellia and anti-inflammatory pomegranate help to fight infections and redness. This oil can also be used by adults with sensitive skin or inflamed skin conditions and sunburn. Explore the entire range of Massage Oils available on Nykaa. 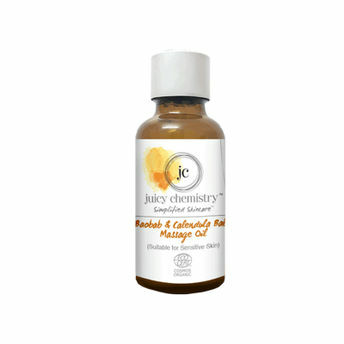 Shop more Juicy Chemistry products here.You can browse through the complete world of Juicy Chemistry Massage Oils .